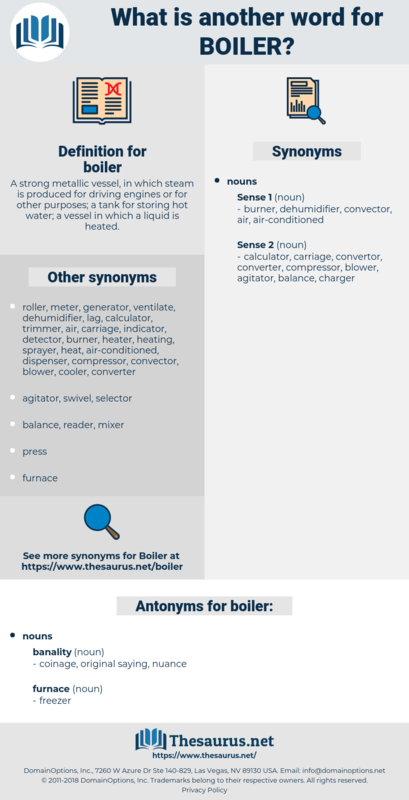 What is another word for boiler? 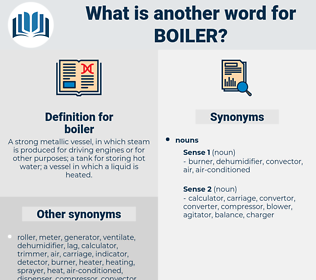 A strong metallic vessel, in which steam is produced for driving engines or for other purposes; a tank for storing hot water; a vessel in which a liquid is heated. Without stopping to think twice, Prudy ran off with trembling haste, and by the time the astonished soap - boiler missed her she had reached Congress Street, and was still running. She is, however, seventeen years old, and her hull shows signs of weakness, although her engines and boiler are in good order. heating plant, steam engine, heating system, heat, heating.